In custom homes built by Woodridge Custom Builders LLC, a new trend is to include a coffee brewing area or ‘coffee bar’ in the master suite and/or kitchen. For some coffee lovers, getting the coffee maker going in the morning is as important as starting the shower and grabbing the morning paper. So for coffee lovers requiring that cup of Joe in the morning while getting roused, up and ready to face a great day, it makes sense to these coffee lovers to include a coffee bar in the master suite. Placing a small coffee maker in the master suite minimizes the numerous trips to the kitchen to start the coffee, to get the cup of coffee, and possibly a refill. The photos below highlight, a coffee bar area was built into this master suite area. The space was actually designed as one of two large master closets. These custom home buyers decided one of the closets was too large and its particular large size of no use them. So they reduced the size of one of the master closets and created this coffee bar. The coffee bar is about four feet wide. The area includes a 48” granite countertop that includes a wet bar sink for obtaining water for the coffee and an under-counter refrigerator for storing cream. Since only one of the homeowners was a coffee drinker, the under-counter refrigerator also stores bottled water and bottled orange juice. 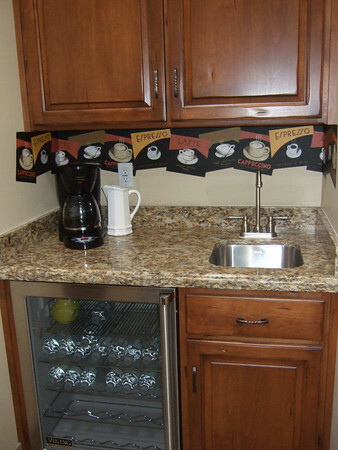 Upper cabinets provide storage for cups, filters, coffee and other supplies. This area, although an afterthought to the original house plans, provides a functional and delightful use of the space. 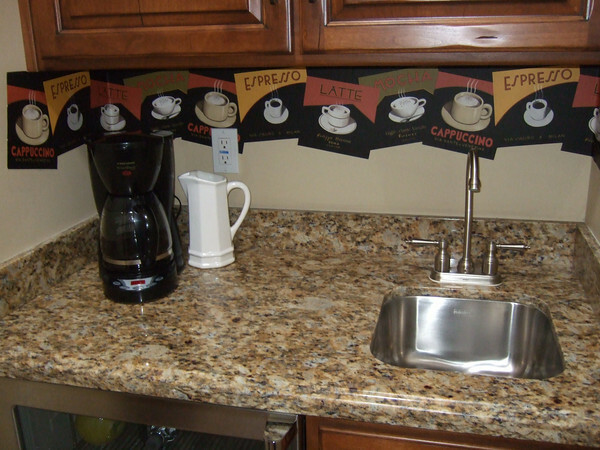 Decorative wallpaper with a coffee theme and coffee accessories add to the charm of the coffee bar. Although these homeowners elected to use a coffee maker that rests on the counter, there are more and more built-in coffee makers designed for home use. At Woodridge Custom Builders LLC, our custom home buyers visit with Andy Welemin of Westar Kitchen and Bath, Tempe, Arizona ( www.westar-sw.com) for assistance with appliances when making selections for a custom home. Westar Kitchen and Bath represents a wide variety of appliance manufacturers, including those that produce terrific built-in coffee-makers and under-counter refrigerators. 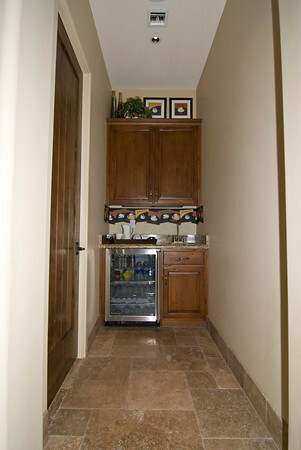 MANY USES OF THE UNDER-COUNTER REFRIGERATOR IN CUSTOM HOMES! Under-counter refrigerators seem to be showing up everywhere lately. In the custom homes built by Woodridge Custom Builders LLC we have placed them in kitchens, wet bar areas, coffee bars, home offices, garages, and guesthouses. Woodridge has also placed them in the master suite. CUSTOM HOME KITCHENS… WHAT’S HOT, WHAT’S NOT! At Woodridge Custom Builders LLC, it’s our business to know what is popular for custom homes. Some styles come and go quickly while other trends seem to have more staying power. It is amazing how long the faux finishing craze has lasted, in fact, the finishes seem to get better and better the longer the style sticks around. Current kitchen styles are particularly important since the kitchen is a predominant area of the house. To get it right it begins with a good set of house plans and home design. Outlined below are features designed and built into some of the homes constructed by Woodridge Custom Builders LLC. For the most part… by the lists below, anything goes! What’s Hot for the New Custom Home! What You’re Not Likely to Find in a New Custom Home!